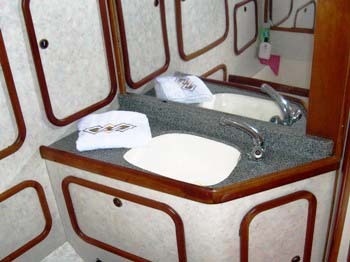 Both cabins have fans & air conditioning overnight at extra cost, and share a bathroom with manual flushing heads & stall shower. 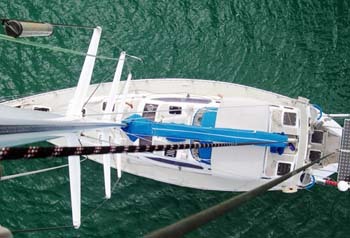 The crew of 2 are self-contained forward. 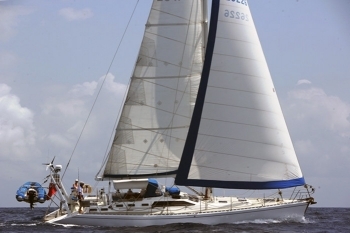 British owner operators Richard and Janet Hough aboard the 54′ cutter SCORPIO are enthusiastic sailors, who enjoy chartering the Windward and Leeward Islands as much as they do the Virgin Islands. 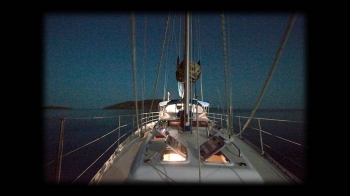 So SCORPIO is available across the breadth of the Lesser Antilles during winter as well as summer. 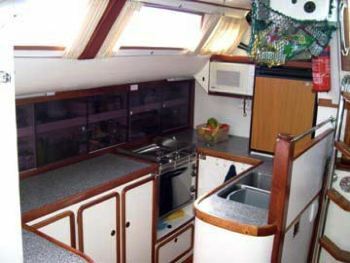 Unless your cruise is ten days to two weeks, it’s best to break this area down to three one week itineraries, including the area between Antigua and St. Maarten (in that direction), the area between Antigua and Martinique, and the area between Martinique and Grenada, the latter of which is really best done in 10 days. If you only have one week, you should start in St. Vincent and end in Grenada (in that order). 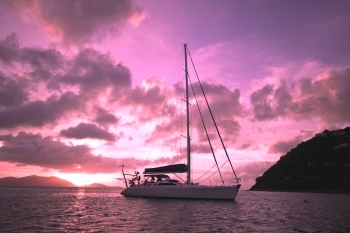 The Grenadine Islands offer deep anchorages, turquoise waters, coral reefs, great snorkeling, sea turtle hatcheries, and a history of whaling and boat building. These sandy atolls are nestled between two huge volcanoes, St. Vincent and Grenada, the spice islands, which export nutmeg, cocoa, vanilla bean, fruits and vegetables to the other Caribbean islands. These two volcanos offer a fine contrast to the sandy atolls of the Grenadines within, which offer turquoise water and short sails between islands (1 to 15 miles apart). If you can stretch your cruise to ten days, we highly recommend beginning in the French island of Martinique and ending in Grenada, sailing by way of St. Lucia’s famous twin peaks, the Pitons, the landmark of the Eastern Caribbean. The wind is on the beam, and there is always something new to do and see each day…. These islands offer rugged mountainous beauty, where waterfalls and black sand beaches offer sights and scenery along the lines of volcanous Hawaii. 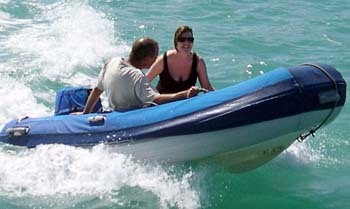 SCORPIO is a dive boat. 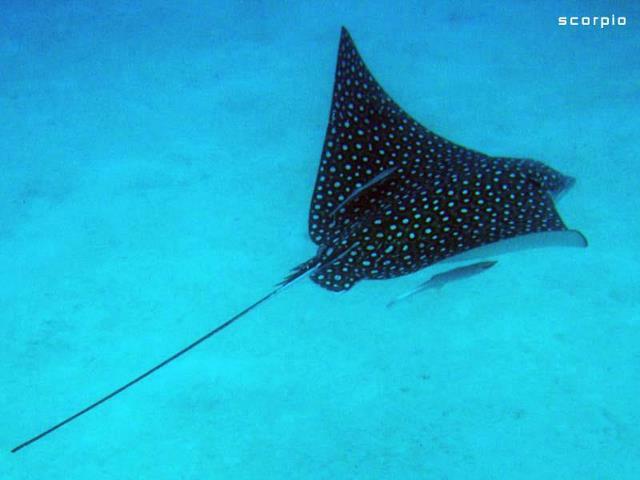 Experienced divers have the opportunity to explore life under the sea with Richard. 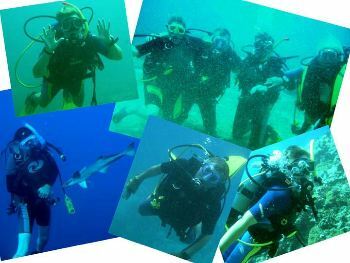 Richard is a PADI dive master and dives with guests. Janet is a qualified rescue diver…. 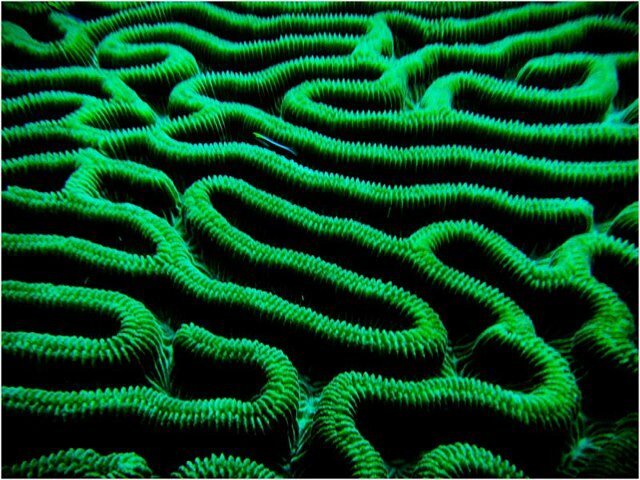 The Resort course is available at no additional cost for non-certified divers | Night dives are available. Services of a shore-based dive firm where required (such as within the Grenadines Marine Park) are not included. 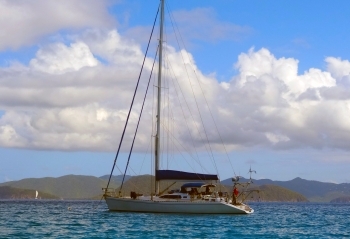 So there’s no extra charge for scuba diving, except in the Tobago Cays, where it’s required by law to hire the locals to dive with you… SCORPIO has a compressor aboard plus 4 tanks, regulators and BCs. 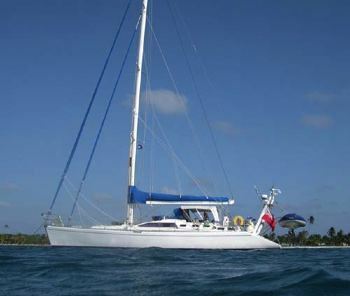 Richard will be delighted to show you the fantastic undersea world of the Caribbean, either snorkeling or scuba diving. 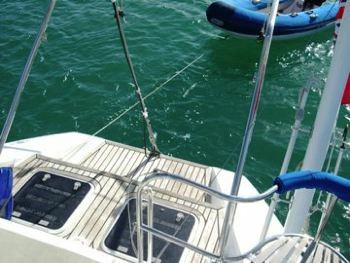 SCORPIO also offers water skiing (skiers must be light weight; the dinghy engine is only 18 hp); snorkel gear, an inflatable double kayak, fishing lines, and underwater camera… A sailing dinghy can be rented in certain areas… Richard is an ASA certified sailing instructor. 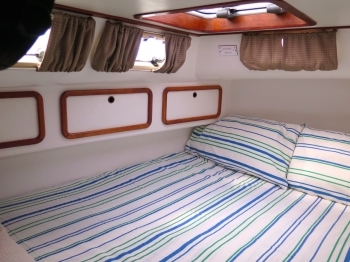 SCORPIO’s dinghy is a 10’ hard bottom inflatable that seats 6 and has an 18 hp outboard on it…. 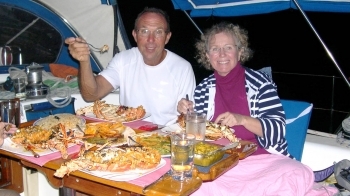 Richard and Jan both gave up successful professional careers to pursue their dream afloat. 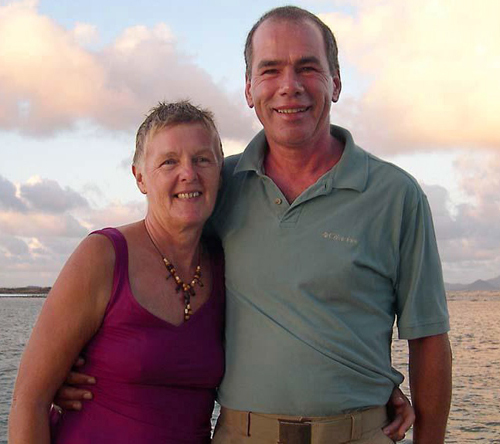 Richard worked in major UK distribution businesses and Jan in human resources in both public and private sectors. Not only did they thrive in this professional environment requiring the provision of high quality services to very demanding customers but they actually enjoyed the challenge. 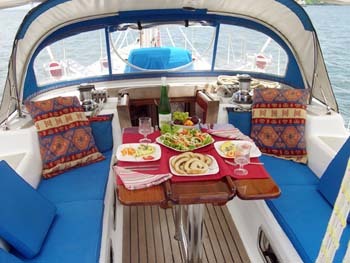 They look forward to welcoming you as guests aboard Scorpio and to providing the vacation of a lifetime in the Caribbean. 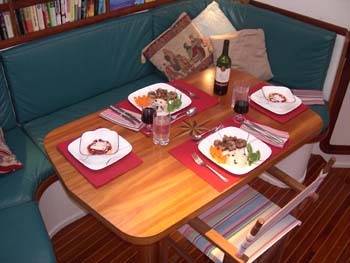 Rates are plus one dinner ashore at Guests’ expense. Plus 10% for Xmas / New Years• Bar includes house wine with meals, local beers & soft drinks are available at all times, evening gin and rum cocktails are also offered. Not Included: Special drinks requirements – eg. vintage wines, champagnes, liqueurs and spirits not normally stocked in the ships bar. 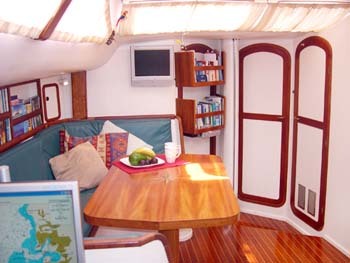 Half Board includes all breakfasts, 6 lunches and 3 evening meals . 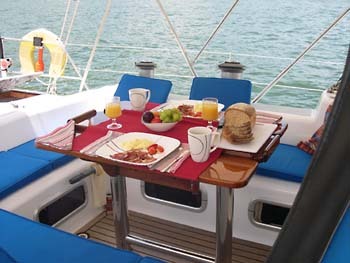 All other meals are to be taken ashore, at the guests’ own expense.